Fossil teeth uncovered in Kenya, Africa, fill a missing link in the evolution of old world monkeys, a new paper reports. Some specimens of A. metios that the team recovered. Image credits D. Tab Rasmussen et al., (2019), PNAS. The 22-million-year-old chompers allowed the team to describe a new species — which they christened Alophia metios — that fills a major gap in the evolution of old world monkeys (family Cercopithecidae), a team of U.S. and Kenyan researchers reports. It forms a link between a 19-million-year old fossil tooth unearthed in Uganda and a 25-million-year-old fossil tooth found in Tanzania. Surprisingly, the teeth exhibit more primitive features compared to those of earlier species of monkeys, giving us an unique glimpse into what the lineage dined on in its earliest days. Kenya find me a tooth? “For a group as highly successful as the monkeys of Africa and Asia, it would seem that scientists would have already figured out their evolutionary history,” said the study’s corresponding author John Kappelman, an anthropology and geology professor at The University of Texas at Austin. The team had their sights set specifically on the fossil-rich region of West Turkana, as the time interval they were interested in studying is only represented by a handful of African fossil sites. West Turkana is very arid today, but between 19 and 25 million years ago it was peppered with lush forest and woodland landscapes fed by a network of river and streams. Hundreds of mammal and reptile jaws, limbs, and teeth were recovered during fieldwork, ranging from 21 million to more than 24 million years old — including remains of early elephants. At first, A. metios’ teeth confused the team. The fossil teeth were very primitive, more primitive than geologically younger monkey fossils, in fact. They even lacked a hallmark structure of monkey teeth, “lophs” — which are a pair of molar crests. 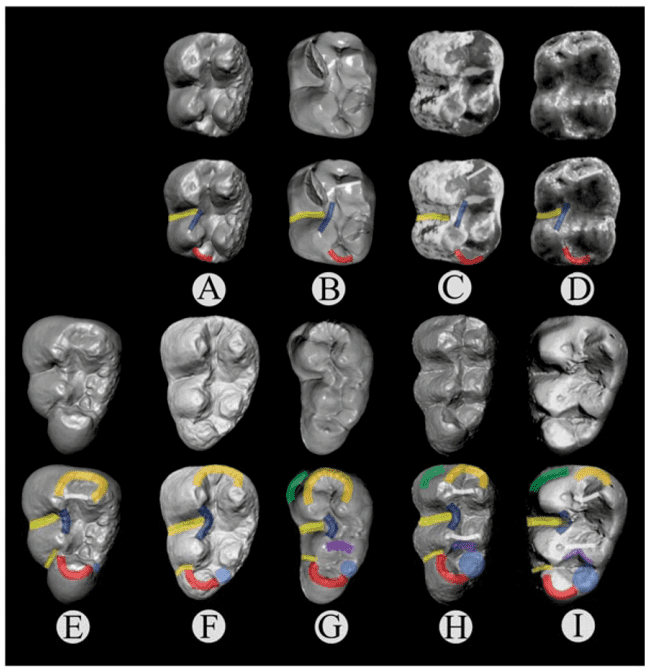 A comparison of cercopithecoid dental evolution over time. Specimens arranged left to right from oldest to youngest species. A are Alophia teeth, B are the same but reversed for comparison. C is Noropithecus, D is Victoriapithecus, E is Nsungewepithecus, F and G Alophia and Alophia reversed, H are Noropithecus teeth in reverse, I are Victoriapithecus teeth in reverse. “These teeth are so primitive that when we first showed them to other scientists, they told us, “Oh no, that isn’t a monkey. It’s a pig,” said Ellen Miller, an anthropology professor at Wake Forest University and paper co-author. The species’ name, Alophia, is a tribute to this feature — the word means “without lophs”. It’s quite a significant result, actually, since these lophs are a key feature of monkey teeth today. Lophs and cusps on molars allow the animals to eat a wide range of foods, from animal to plant matter. These teeth are like “uber food processor[s]”, the team explains, and helped monkeys adapt to the diverse environments they inhabit today, from Africa to Asia. “It is usually assumed that the trait responsible for a group’s success evolved when the group originated, but Alophia shows us this is not the case for Old World monkeys,” says co-author Samuel Muteti, a researcher at the National Museums of Kenya. Monkeys as a lineage first appeared during a time when Africa and the Arabian peninsula were still joined together. Species here evolved in relative isolation until the whole island-continent connected to Eurasia, between 20 to 24 million years ago. After this time, we see mammals such as antelope, pigs, lions, or rhinos — what we’d consider African species today — making their way to Africa and Arabia. One of the team’s hypotheses is that these immigrant species placed a lot of environmental stress on monkeys, and competition between them and the new arrivals drove monkeys to start exploiting leaves as a food source. Alternatively, changing climate conditions could have been at the root of this dietary shift. 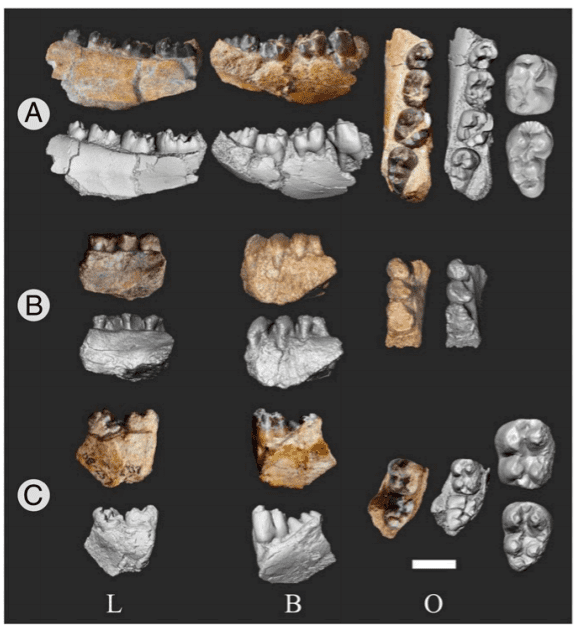 The paper “Primitive Old World monkey from the earliest Miocene of Kenya and the evolution of cercopithecoid bilophodonty” has been published in the journal Proceedings of the National Academy of Sciences.